The primates radiated extensively during the early Eocene, about 55Myr ago (Rose, 1995; Hartwig, 2002). The oldest groups, the omomyids and the adapiforms, apparently migrated into North America and Europe. This is assumed because the rich mammalian fossil record of earlier parts of the Palaeocene in those continents contains no evidence of primates. The origin of primates has been sought in Africa and Asia, and a number of possible primates have been reported from the Palaeocene of both continents, but the specimens are solely teeth and they are hard to confirm (Rose, 1995). The prize for the oldest confirmed primate may go to Altiatlasius, based on ten isolated cheek teeth and a dentary fragment of a juvenile from the upper Palaeocene of Morocco (Sige et al., 1990). The teeth (Figure 11.2(a)) show resemblances to plesiadapiform and primate dentitions, but they are more primate-like, and Altiatlasius was identified as an omomyid (Sige et al., 1990; Rose, 1995). It was a tiny animal, about the size of a modern mouse lemur, and weighed perhaps 50-100 g.
The omomyids, from the Eocene of North Europe and Asia (Szalay, 1976), were all small tarsier-like tree-dwellers, although most of them were larger than Altiatlasius, weighing 100 g to 1kg in life. Some of the later forms reached 2.5kg. 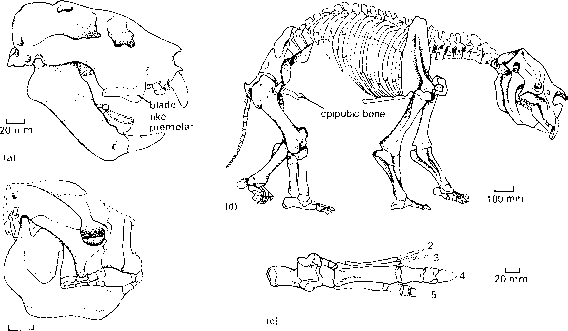 Tetonius (Figure 11.2(b-d)) has a short snout, a bulbous braincase and an obvious postorbital bar. The orbits face forwards and it is likely that these early primates already had stereoscopic vision. Omomyids show adaptations in their limb skeletons for climbing, grasping branches with thumbs and large toes and leaping from branch to branch (Rose, 1995). Omomyids have been variously treated as ancestors of modern tarsiers, or as close relatives of the higher primates (see Box 11.1).